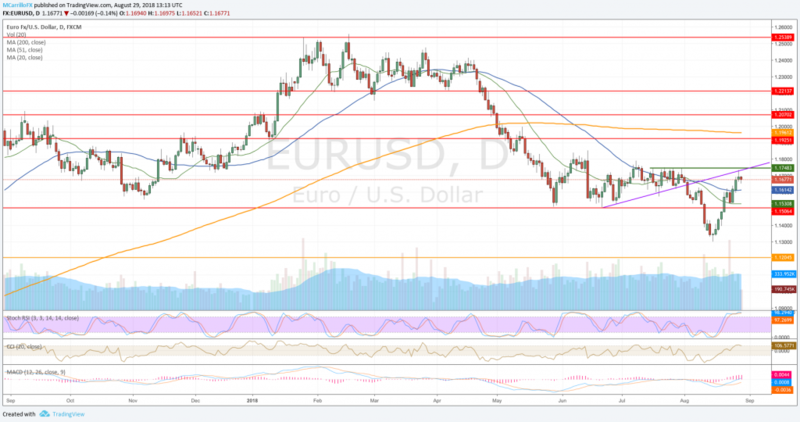 The EUR/USD is trading negative for the first time in four sessions as the Dollar has reacted positively to US GDP numbers and the euro is depressed following weak consumer confidence in Germany. The annualized gross domestic product in the United States rose at a pace of 4.2% in the second quarter, better than the 4.0% waited by the market and an improvement from the 4.1% reported in the advance estimate released in July. 2Q GDP was a significant advance from the 2.2% reported in the first quarter of 2018. Earlier in the day, the Gfk reported a 10.5 reading in its consumer confidence survey for September, a decline from the August figure of 10.6. Market expected a steady number between August and September. Back to the chart, EUR/USD is currently trading 0.16% negative on the day as it is moving at 1.1675. The pair is extending a rejection from the dynamic resistance at 1.1730. FXStreet analyst Yohay Elam considers that the technical picture remains bullish for the pair. Elam thinks that the move is a natural correction He also comments that China and consumer confidence in the United States are factors that can explain the EUR/USD setback. If the pair extends its rejection, it will find supports at the 50-day moving average at 1.1615 first, and the 20-day ma at 1.1530 secondly. Below these two levels, check for the 1.1505 critical support. To the upside, the pair needs to recover the 1.1700 area before giving bulls new hopes. Above there, check for the dynamic resistance at 1.1730 and then the 1.1759.